Apricot purée is on the rise as a new substitute for oil or water in many high-calorie, high-fat recipes. Simply purée canned apricots in a blender or food processor until smooth. Unlike prunes (which can darken some baked goods) or applesauce (which may cause recipes to be watered down), apricot purée reduces the fat content and adds a touch of flavor. Fresh apricots can be frozen to last throughout the year. Apricots bruise easily and decay. Keep away from heat and sun. Ripen at room temperature and then refrigerate at 35 degrees F, 80% humidity. Look for plump apricots with as much golden orange color as possible. Stay clear of fruit that is pale yellow, greenish-yellow, very firm, shriveled, or bruised. Apricots that are soft-ripe have the best flavor, but they must be eaten immediately. Most fresh apricots are marketed in June and July, but a limited supply of imported apricots is available in large cities during December and January. Domestic apricots are grown principally in California, Washington, and Utah. Apricots develop their flavor and sweetness on the tree, and should be mature but firm at the time that they are picked. 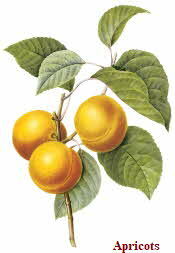 Look for: Apricots that are plump and juicy looking, with a uniform, golden-orange color. Ripe apricots will yield to gentle pressure on the skin. Avoid: Dull-looking, soft, or mushy fruit, and very firm, pale yellow, or greenish-yellow fruit. These indicate overmaturity or immaturity, respectively. Apricots will ripen at room temperature. To help them ripen, place them in a paper bag with an apple. When they yield to gentle pressure, they are ready to eat. Refrigerate ripe apricots, unwashed, in a paper or plastic bag up to 2 days. Wash them before eating. They are a perfect fast food anytime. To cut fruit, slice around its seam, twist it in half, and lift out the pit. Eating dried apricots is a great way to get your 5 to 9 Fruits & Vegetables A Day. The nutrients (e.g., beta-carotene and niacin) are more concentrated in dried than in fresh apricots. Dried apricots also have a higher sugar content, which makes them more likely to stick on your teeth. Your dentist will remind you to brush or rinse your teeth after eating any dried fruit or sticky foods. If you’re allergic or sensitive to sulfites, remember to look on the label of the package to see if the apricots were treated with sulfur dioxide for color preservation. Look in health-food stores for apricots that were not treated with sulfites. They’ll be brown, not orange. • Canned Apricots are U.S. Grade B, unpeeled halves. • Apricots are packed in unsweetened fruit juice, light syrup, lightly sweetened fruit juice and water, or lightly sweetened fruit juice. • Apricots are packed in 15.5-ounce cans, which is about 2 cups, or 4 ½-cup servings. • Store unopened cans in a cool, dry place off the floor. • Store opened apricots in a covered nonmetallic container and refrigerate. Use within 5 to 7 days. • Canned apricots are a delicious dessert served directly from the can, with juice, either at room temperature or chilled. They are also a wonderful addition to any fruit salad or dessert recipe. • Use canned apricots in baking, cobblers and crisps. • The juice from canned apricots can be drained and thickened with flour or cornstarch to make a fruit sauce for ice cream or pancakes. • Freeze the drained juice in an ice cube tray; use instead of ice cubes in cold drinks or iced tea. • Use the drained juice as part of the liquid when making gelatin desserts. • Apricots are an excellent source of Vitamin A. • 1/2 cup of apricots provides 1 serving from the Fruit Group of the Food Guide Pyramid.